I started following baseball pretty closely way back in 1960. The Chicago Cubs were one of the worst teams in the National League back then. Even though they had Ernie Banks in their lineup and seemed to be adding young quality players like Billy Williams and Ron Santo to their roster, the only reason the Cubbies were able to stay out of the NL basement was the league’s expansion, which added even worse teams in Houston and New York. Then in 1966, two things happened. The Cubs made Leo Durocher the team’s Manager and made a trade with the Phillies for center fielder Adolfo Phillips and a Canadian-born pitcher named Ferguson Jenkins. From 1960 until 1966, the Cubs finished a regular season with a better than .500 winning percentage just once. From 1967 until 1972 they bettered that mark every single year. Lot’s of veteran Windy City sports pundits credit “Leo the Lip’s” fiery leadership for the team’s dramatic turnaround. I think it was Jenkins’ pitching that did the trick. The big right-hander was a 20-game winner in each of those six seasons and he also averaged 250 strikeouts and four shutouts per year during that span. The Cubs had always been able to hit in the friendly confines of Wrigley Field but they had historically been able to get their hands on very few pitchers who could dominate opposing lineups visiting that same park. Jenkins was an exception. But in 1973, Fergie had his first off-year as a Cub, finishing 14-16 with an ERA that crept uncharacteristically upward toward four runs per game. Still, I was shocked when Chicago traded their ace to the Texas Rangers for a second baseman, Vic Harris and a youngster named Bill Madlock. Jenkins went to Texas and immediately led the AL in victories with 25 during the 1974 season. Another off year and another trade followed. This time he landed with the Red Sox. Boston had just won the 1975 AL Pennant only to lose the World Series to the Reds. Boston’s front office was counting on Jenkins to add the quality depth they felt the team’s starting rotation would need to defend their league championship and beat the elite teams that make it to postseason. Unfortunately, that didn’t happen. 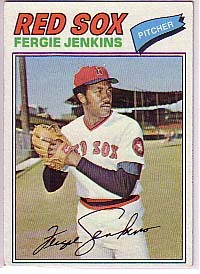 Jenkins pitched just “OK” during his two seasons in Boston and way below expectations. He went 12-11 in 1976 and just 10-10 the following year as Boston watched the gap between them and the hated Yankees grow wider. Thinking his best years were already behind him, Boston returned Fergie to Texas in December of ’77, for a guy named John Poloni and some cash. Naturally, Jenkins bounced back with an 18-8 season for the Rangers in ’78. He would play until 1983, retiring with a 284-226 record and becoming the only big league pitcher in history to accumulate more than 3,000 strikeouts and fewer than 1,000 walks during their career. He was eligible for the Hall of Fame by 1988 and was considered a shoe-in for induction by most observers. He didn’t get voted in, however, until 1991. A 1980 incident in which he was found to be carrying drugs in his luggage during a Ranger road trip to Toronto certainly damaged his public image. Tragedy struck his life in 1992, when his fiance committed suicide and took Jenkins’ three-year-old daughter with her.